The nineteenth century was a time of rapid change in forms of organization of economic activity. A central feature of such change was, inevitably, the development of new types of finance adapted to the radically new environment. An appreciation of the history of these developments makes a substantial contribution to the understanding of the growth and development of the British economy in one of its most dramatic phases. 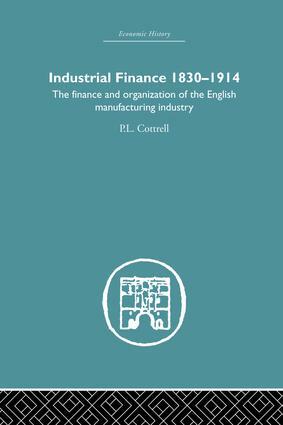 Philip Cottrell has written an impressively documented full-scale survey of this crucial period, discussing finance in the context of sweeping reforms of company law, unprecedented technological change and economic expansion, and the institutional effects of all of these. He is primarily concerned with English manufacturing industry but frequently refers, by way of comparison, to extractive industry, Scottish and Welsh developments and the economies of other West European countries. As well as providing a comprehensive overview, the book pays particular attention to coal, iron and textiles amongst the industries and, at the level of organization, to the emergence of the joint stock limited liability company and its gradual adoption by industrialists. The relationship between commercial banks and manufacturing receives detailed consideration and the role of internally accumulated funds and trade credit is discussed. this classic book was first published in 1980.